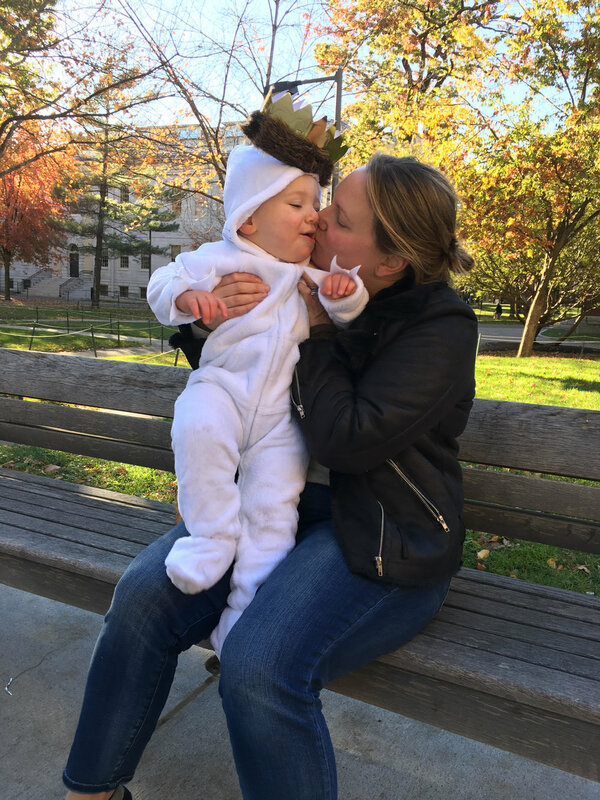 Halloween, guys. I truly didn't realize how weird this holiday is until I tried explaining it to a toddler. Luckily he's satisfied with "It's pretend" when he asks about skeletons and ghosts, but if he ever asks "Pretend, what?" I will not have sufficient answers. Pretend dead people whose spirits hang around and scare the living? NOPE. Shut it down. Apparently, I really gravitate toward graveyards and skeletons for Halloween (and other holidays). Exhibit A: This healthy graveyard from last year. Next year, no bones. So, this "boneyard bark" is slightly more appropriate for the older set since it might require more explanation than you're willing to give to your small person. But M digs the yogurt pretzels, so we focused on that aspect. This bark is so easy and a great last-minute party treat. If you have a Michael's or a Target in your neighborhood, you can probably get everything there. The most complicated part is getting the bones together, but it's not actually complicated. First, melt the white chocolate and coconut oil in the microwave. Heat it for 10 seconds at a time, stopping and mixing after each 10-second burst until melted. Prep a cookie sheet with a piece of parchment paper and clean out space in your fridge to chill the bones. Next, cut your pretzel stick in half. 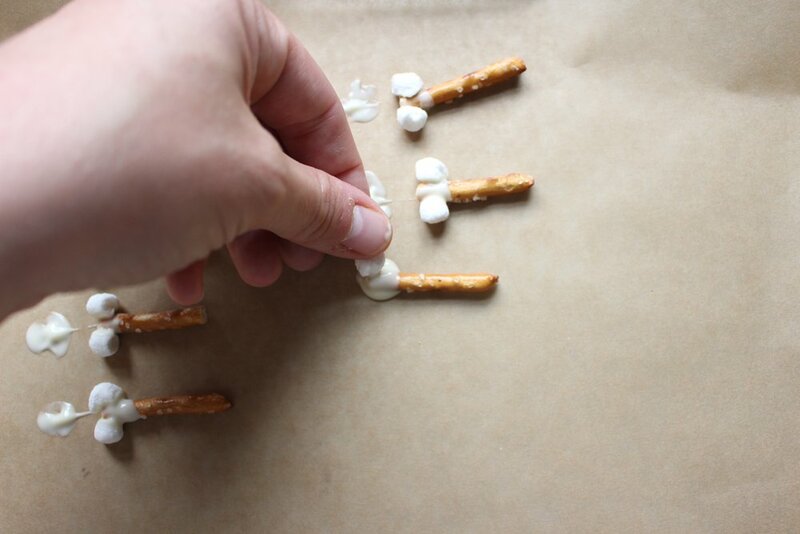 For each 1/2 pretzel stick, you'll need one mini marshmallow. 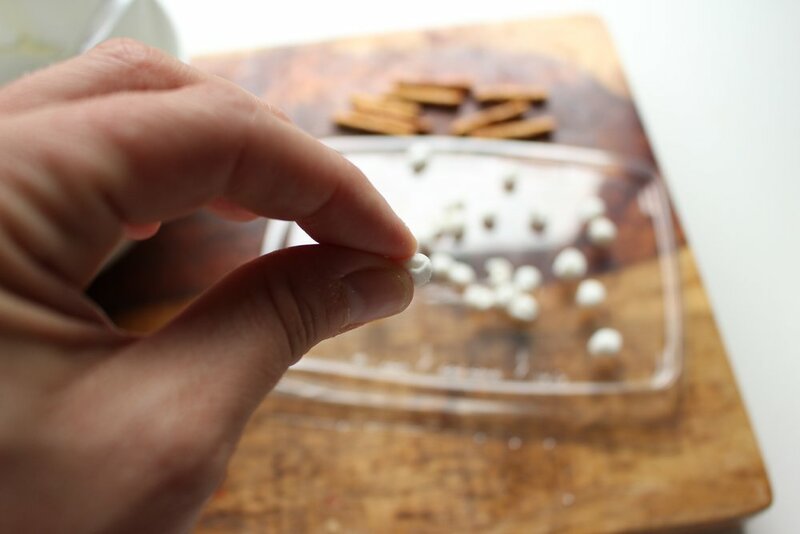 Cut the marshmallows into four smaller squares and roll each 1/4 marshmallow between your thumb and forefinger to make it into a small circle. Dip one end of the 1/2 pretzel into the melted chocolate and place on the parchment paper. Carefully stick two of the 1/4 marshmallows onto the chocolate and hold for a few seconds to set. 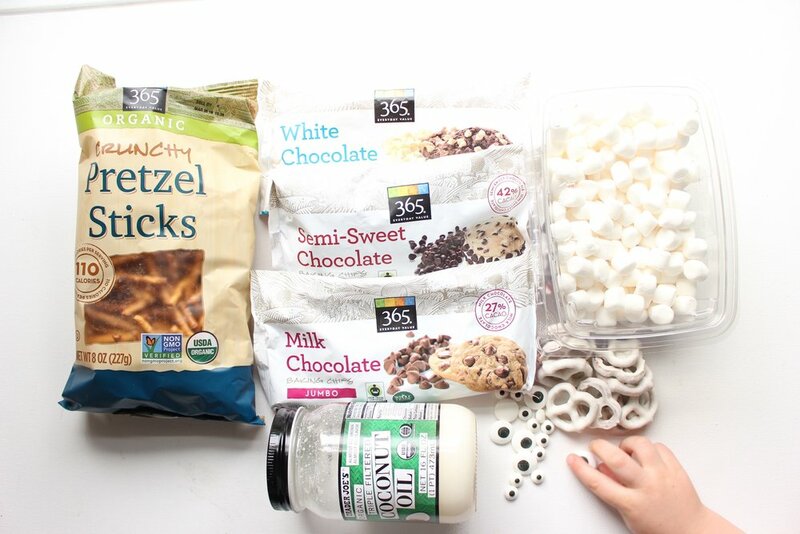 Lift the pretzel with the stuck-on marshmallows and move them about 1/2 an inch to remove some of the extra chocolate before chilling. You'll have to keep your fingers on the marshmallows so that they don't fall off while moving. Repeat above steps on the other side of the pretzel and chill for another 10 minutes. Reheat your chocolate slightly (5 seconds) and stir. 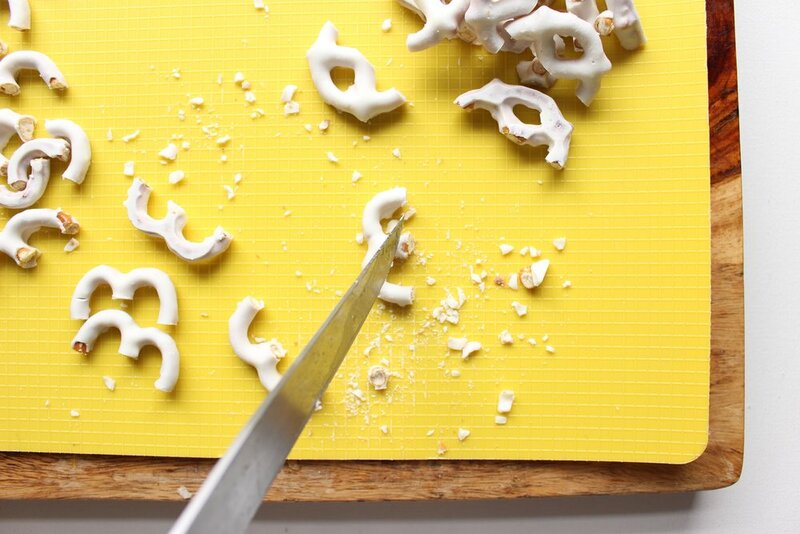 Dip the whole pretzel and marshmallow bone into the white chocolate with a fork and gently tap on the side of your bowl to let the extra chocolate drip off. Move back to the fridge and chill for 10 more minutes. Saw the yogurt pretzels in half with a sharp knife and take off a little bit of the middle nubbin that's left between the pretzel's two arches. These arches will be the ribs. The bottom half of the pretzel can be the pelvis and any pieces that break off (and lots will, don't worry about it) can be used to make the arms or legs. Set aside the cut pretzels. 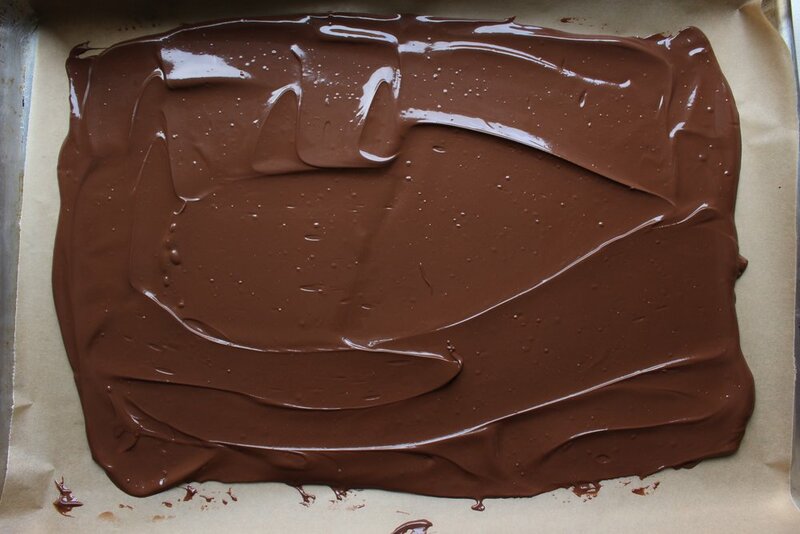 Melt the chocolate and coconut oil in the microwave, stirring after each 10-second burst until everything is melted. Pour the melted chocolate onto a fresh piece of parchment paper on a cookie sheet and spread into a thin layer (but not too thin). 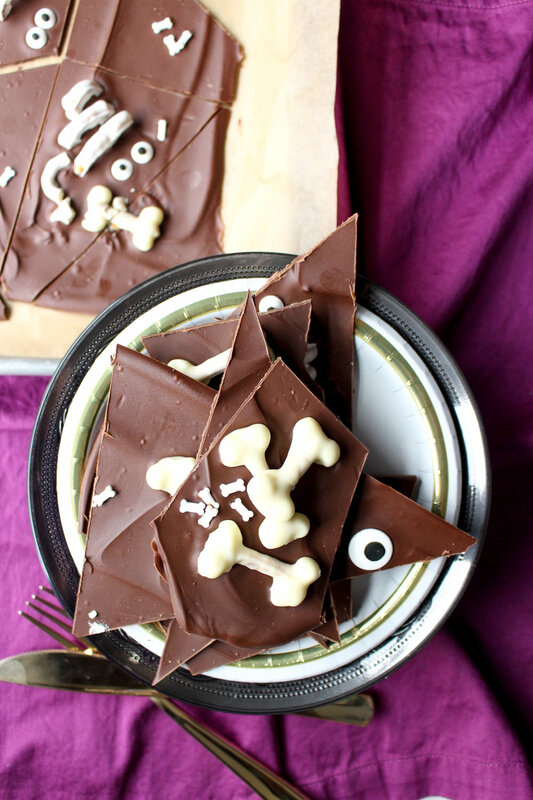 Place your pretzel bones, pretzel ribs, candy eyes, and candy bones (if using) onto the warm chocolate. Once you feel satisfied with your arrangement, chill for at least one hour, but up to 24 hours in the fridge.